Leeds Clothing Haul and Movie Night! So after an early morning star with a driving lesson and the worst night's sleep (for some reason I kept waking up shivering), mum, Jess, her boyfriend and me went to Leeds to go shopping. To be honest, it's as close as Trinity Walk Wakefield because we live right in the middle of both so either or is easy. It was a really long and tiring day but it was relatively successful - for me! I had vouchers for Victoria Secret PINK! and Accessorize but unfortunately I didn't find anything I loved in Accessorize. A beautiful thin, almost linen-like material, hoodie. It has a peekaboo back which I think looks stunning and will be perfect to wear to the beach. I've really wanted a mask since I've watched a few YouTuber's give reviews and so when my favourite (sounding) mask was on special offer I decided to treat myself to 'Mask of Magnaminty'. 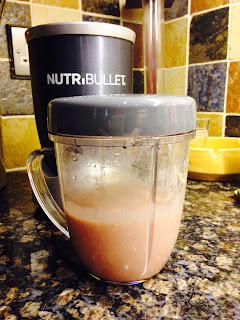 I don't know if anyone caught my last NutriBullet blog post but I have to say, although it was still edible, it wasn't enjoyable. I tried to fit everything into it possible to have lots of nutrients but this week I've learnt the simpler the better. It tastes so much better with just a few ingredients rather than anything and everything. They smell amazing and taste so much better. Of course, the fruit ones taste a little better but the vegetable ones are still nice. I love a lot of fruit but I hate the taste of vegetables, which is the main reason I got the NutriBullet. I know I need to eat more to be healthier. Before, I only ate raw carrots and everything else was a no-go. Fruit, I tend to love: cucumber, apples, grapes, melon, bananas. Other fruit I like the smell and flavouring of but hate the texture, like mango, strawberries, blueberries and raspberries. I think this is a great way to eat more of those types of food. For my birthday, from dad, I got a NutriBullet. Today I tried my first drink, a 'NutriBlast'. I hate vegetables and rarely have any - the odd raw carrot. Spinach CucumberA banana StrawberriesBlueberriesGrapes RasberriesAppleA handful on pumpkin seeds Water I swear it tastes better than it looks! I managed half for breakfast; I think I made a little too much to be honest! The dogs were gifted to me on my 12th birthday as they were born 3 weeks before my birthday. They were from a friend (my dad's ex girlfriend) so we saw them being born. We have literally been a part of their lives since day 0. Another friend brought their brother so there's three we still see often. My original baby, the runt of the litter. Well behaved, good listener and appreciative. She is still the smaller the sisters. The 'extra' dog we came home with on the day we went to pick them up :') She's chunky and was my sisters. Completely loveable, loves hugs, attention, licking people and cuddles. Pet Peeve: something that a particular person finds especially annoying. 2. Nail filing. The sound drives me crazy! 4. People who tell the same story again...and again...and AGAIN! 5. People who cancel plans last minute. Why waste my time?! 6. Cheats. In all sense of the word but mainly relationships. 7. Push overs: people who don't stick up for themselves and let others walk all over them. 8. Indecisive people who can't make up their minds. If I ask where you want to go, I know where I want to go already but I don't want you to hate my decision and seem controlling.